Maybe, It’s more like … let the “practice” begin. The pups are rapidly becoming dogs. They all think they want to work, but not all are mentally ready. Will be a challenge for me as they are all different. It’s been a long hot summer – hoping for a cool fall and winter so I can decide who to keep and who to sell. Right now it’s a “toss up”. CORE: Is more than “ready and willing” and almost ready for “real” training. He is calm minded, smooth moving, biddable and loves to work with me. All this makes him very enjoyable to work and sheep seem to like him (always a bonus). I have been taking it slow and easy on actually “training” on him because I know he can be sensitive. My approach is slowly changing as he is maturing. He is still sensitive off stock but getting “firmer” minded on stock. He always seemed to take more “pressure” on sheep, but I would rather be “safe than sorry” knowing his nature. He has great balance and eye and feel. He can hold “Away” side pressure without over or under flanking. He tends to “fall” in behind on his Come Bye side and I’ve been working on -pushing him to “over flank” past balance – to get him more flexible and bendable on that side. He looks as if he will be easy to teach to drive (especially if I start driving with him on that side – Which I don’t want to do until he’s covering better). He wants to please and keeps me in mind when he’s working. That adds up to a lot in my book – having a dog that enjoys working with you makes all those training hours more enjoyable. COVE: is as nice but different from her brother. She is very reactionary and tends to be “jerky” in her movements if her minds not settled. So, I’ve been working on her mind through her body. If she reacts I lie her down until she’s settled enough to flank calmly and smoothly. So, for now all work will be up close. Sheep don’t “lean” on her like they do with Core mostly because of her tension. I do think she will have pace when she learns to work calmly. She’s “wired” in regular life also – so can’t change her character but can change how she reacts to sheep. She is of the nature if you “get on” her she will just go faster (Core tends to back off to much – totally different in that area). She can also tend to grip if the tension gets the best of her – something I don’t want to encourage – so she will be brought on slow and easy. She really thinks fast and furious is so much more enjoyable but since she is so driven to work – she can take training. However, training will be paced so she learns to work sheep with her mind more than her body. NEX: is way to young to train BUT, don’t tell her that! She is driven to work, but driven doesn’t mean she is ready for actual training. I take her out every once in awhile and let her go both ways around sheep. 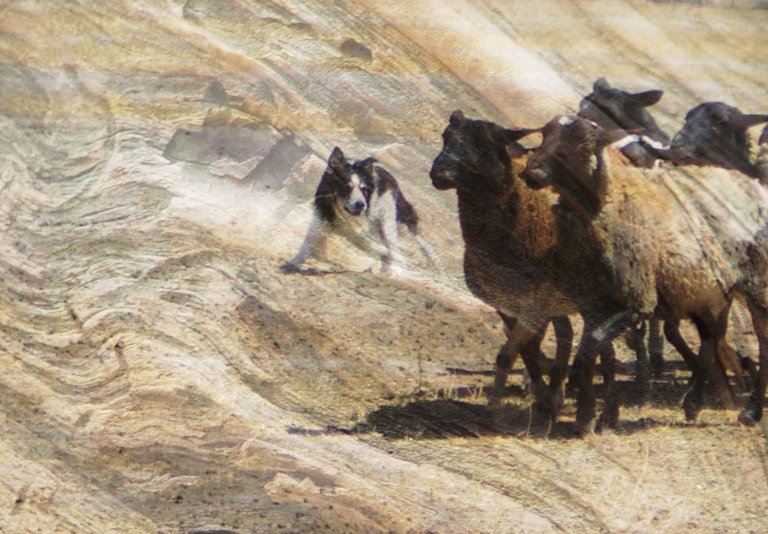 No training – just exposure with very dog broke sheep. RIM: is a very old gentle soul. He’s calm, cool and very biddable. He’s also very immature – his instincts are “kicking” in, but he’s not even close to being mentally or physically ready. So, I do the same as I do with Nex – exposure once a week or so. He doesn’t seem to have a lot of eye … but again since I haven’t backed him off (and won’t until I feel he’s ready) … so, can’t really say. RAIT: Is on “injured reserve”. She keeps getting lame on me – so she’s “laid up” for a month until I can sort it out. Kept thinking it was her pads but don’t want to chance it. Students are always asking why doesn’t my dog listen to me? It all starts “up close and personal”. In order for a dog to work with you … you have to be in his mind. He can’t hear what you are saying if he’s not listening. So, how do we go about teaching a dog to listen to us better — “communication and trust”. When first starting a pup if your guidance gives him better control of his sheep (which is everything his instincts are compelling him to do) he will learn to rely on and trust that guidance. If everything you do/say makes him lose his sheep that trust will quickly be eroded. With young dogs the last thing you want is a conflict between what you are making him do and what his instincts are driving him to do. A “well bred” dog will do everything he can to listen to instincts before you. Which is great because this is what we use to mold him into the working dog he will become. 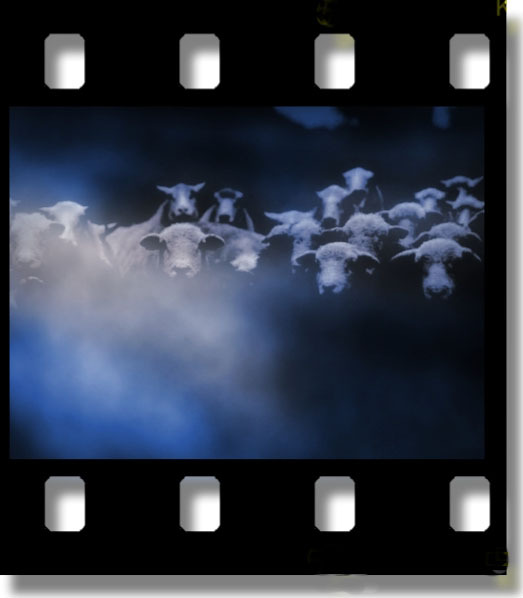 You don’t want to force his attention on you … his attention should be with the sheep. However, this doesn’t mean you have nothing to say about HOW the sheep are to be treated. He needs to know that they are YOUR sheep and you are allowing him to work them. So, he works the sheep and you work him – by controlling the sheep. You are working on his mind so you become an indispensable part of his wondrous experience called “sheep work”. In the beginning you are developing his awareness that you can help him. The more he connects sheep work to you – the more he listens and trusts you – the more control you will have when you start increasing his distance from you. A dog at 800 yards DOES have a choice to listen or not. If you insist on total control by doing nothing but giving orders until he “gives up” you are not building communication … because no actual communication took place. 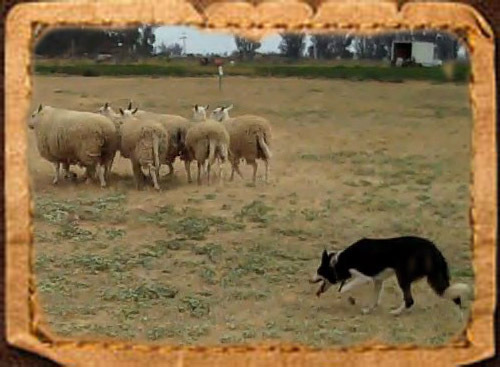 You might have a dog that obeys – but If all you are teaching is how to make random moves (flank/lie down, walk-up, etc) without the sheep reacting to HIS movements … then you are not using “instinct building blocks” that are logical to the dog. That of course doesn’t mean he won’t make mistakes only that when mistakes are made – he will get a correction that allows him to work his sheep more effectively. Try to remember this is about WORKING sheep not making a dog move left/right. Working sheep is learned (more by you than the dog … since he at least has instinct to go on :@) by making mistakes then realizing your actions have repercussions and learning from these mistakes (actually – doesn’t that summarize life :@). Eventually training has to go against his instincts (i.e. off balance flanks, stopping when sheep are running away, etc.) BUT hopefully by that time you will have built that “working relationship” that he trusts you enough to go to the next level. A lot of novices tend NOT to watch the sheep’s reactions. Sheep are not inanimate objects for dogs to “play” with. They will learn “tricks of the trade” – and depending on your dog these can be good “tricks” or not. If your dog buzzes them with every flank – they learn to go sideways (trying to avoid the “buzz”). If your dog never takes pressure off – they will never learn to settle when worked. If your dog doesn’t put enough pressure on and then too much – they will learn to not move until chased. The “list” goes on … all the while your dog is learning all these wrong approaches to working sheep “up close” – he can’t wait to get some distance from you so he can become more proficient at them. I know it’s not easy for a novice to combine the two at the same time … but if you want correct dog work … it’s a the only way. You communicate to the dog the correct way to work sheep and the dog communicates to the sheep that they will be treated with respect if they move. I was going to update the pups with a video instead of writing about them. A number of people emailed and asked if they could visually see the difference between them … and I have trying for the last 2 weeks. It’s difficult enough to video the trained ones while trying to work them – but pups – make for “seasick” videos :@). Still working on it. They are both progressing well and still very enjoyable because they allow me to work on different issues – which keeps my mind busy trying to figure out how to best let each dog grow and learn. It can get “stale” if you are working on the same thing day after day. We are still working on his “push” on the drive. That’s his “hole” and he’s not sure how to “fill it” yet every once in a while he forgets to be cautious and just takes hold of them forges on … and I stand back *with a smile on my face* and let him. I am working on a “get up” (both verbal and whistle) command and that means “fast forward” … encouraging him to have more FORWARD … even if that means occasionally running through the middle of them. Later on I can refine this down to just a speed up command. That’s one of the keys in training. Learn to put a “rough draft” on a movement or action you want FIRST then later on refine it down. Don’t try to start with the refine move and “rough it up” later. I believe pups need to be pups NOT perfect young dogs. At one point we had an issue with his come-bye outrun. I have an area (depending on where you stand) that on the “come-bye” side the dog has to follow a fence and then take a hard 45 degree angle to his left to have a correct outrun. He is such a natural outrunner that would confuse him. He would run out trying to be correct and hit a fence and stop. So, I would walk out and encourage him on. Amazing what confuses them sometimes. I’ve had some that would cut in if there was a shadow on the ground. Tech is going to be slower … not that he doesn’t have talent. Just his talent comes in a “different form” than Gear. Kind of having one kid that slowly plods along but each step he takes he is learning something – where another one shines from the very start. I’ve always said not how they start but how they finish that counts. All this means is he will need to develop at a slower pace. He will have to learn how to outrun correctly before I can send him any distance which means walking for me .. “over and over” to make sure his “top” is correct … and that takes more time. He needs to learn how to bend off on a flank without leaning on his sheep … once again time. He wants to move sheep in a straight line (great for the drive) but when I need to change directions … straight doesn’t “cut it”. He had an issue about pulling them off the fence if I wasn’t between him (again back to his straight line “theory”). So, we set it up … over and over again. I would use as little instruction as possible (but still try to keep him right). What I was “aiming for” – was for him to figure it out on his own. He ran through the middle, he stopped and held them up against the fence and did a few dozen other things wrong … but he WAS learning with each correction I gave him. He received a correction when he was wrong but then allowed to “motor on”. I was trying to develop an understanding of not only sheep and pressure but where I was (and keep me in the back of his mind). You give enough pressure/correction to let them know WHAT is wrong but enough freedom to let them learn as they go. Some train up easy … some are more difficult but I think that is one of the things that makes training so thought provoking. Trying to “find clues” as to what works with each dog to bring out the best in them. I will keep working on and getting a video (that’s actually watchable) to show the difference in them. All the while I’m training I’m trying to incorporate the dog’s ability to control himself instead of leaning on me as the only controlling force. To me this is starting point for “teamwork”. These dogs have exceptional abilities so I always try to “harvest” each and every aspect of it. Of course, some have more talent than others and you do have to work with what you have. BUT, if you don’t try to develop his potential to interact with you – you will end up with less than a partner. Never forget that self-control is a two-way street. You can’t be succesful at bringing out the best in a dog if you aren’t in control of yourself. This includes, mentally, physically and emotionally. You have to remain calm and give your corrections without infusing anger. Hard to accomplish sometimes but if you aren’t in control – how can you expect your dog to be? Here lies a “paradox ” — a lot of people training dogs are “high drive” – “type A” personalities and tend to be emotionally committed to perfection. This, of course, makes it difficult to allow a dog to “learn from his mistakes” instead of just “controlling every situation”. Even trainers that aren’t “type A” have a lot of emotional involvement and intensity of commitment which tends to make them emotionally over react. Dogs respond to emotion – so the “ball is in your court”. With some dogs I find it very easy to stay in the calm-training-zone but then there are others that send me into “overdrive” :@) Then to compound that … once started it usually does nothing but “ramp up” (which is exactly the opposite of what Is needed). I have tried every “trick of the trade” to stay cool-minded with the ones that set me off emotionally and it’s still not easy. I usually just lie them down and let us both cool off. I want the dog to know although I’m leading the dance I want a dance partner (and don’t want to be “fighting” him every step). This partnership will never happen if I spend all my time being frustrated, angry or upset with every thing he does. I try to look at training problems as opportunities to be explored – helps keep me in the right frame of mind. You know the old adage it’s not the destination but the journey. A truly effective trainer must be emotionally committed to getting the job done correctly and will do “what ever is needed” to accomplish it. However, you need to acquire the ability to discipline yourself so your emotions don’t force the dog into something he is physically and mentally unable to master at that particular time. Look at it as a great way to teach yourself patience. Try to take everything one step at a time and then build on each step. Always remember if needed you can freely step backwards and start over without any harm being done in your training. Sometimes it’s the best solution for both of you. I’ve always thought that good training was “Pretzel Logic” in that working dogs is such a physical act but in reality it’s amazing just how much mental and emotional energy is expended if it’s done correctly. I have a few young dogs that are just starting and thought I would comment on what I’m looking at/for when I work them at this young stage. All I’m looking for is a glimmering of “things to come”. I’m not expecting a pup to work like trained dog … but I am looking for the potential of one. There are things I will “note” so I will have an idea of what I’m are going to need to “adjust” in my training to get the best out of them. I want to “see” the kind of eye that holds the dog back “just enough” that allows him to keep his sheep together but not so much he won’t push into his sheep. I want to see him trying to control the direction and speed of the sheep. I’m wanting a natural cast … meaning “at this stage” … he doesn’t run straight for them but curves around trying to contain the entire “bunch”. “In other words” seeing if he wants to go around ALL the sheep not just what his eye catches. I want to see if he will push pass “pressure point” to keep them moving (even if that means coming in for a little wool grabbing). Or will he just keep flanking around trying to hold the sheep instead of making them move forward. I want to see if how much he cares that I’m in the picture – also if he moves away (or towards) my pressure. Some dogs don’t move away from pressure but towards it (so you need to note that so you can work around it as training progresses). I’m looking to see if he he likes to cover his sheep? Does he cover both sides “equally” or tend to eye up the first/ last sheep one one side or another. Does he always want to go to the head or is he comfortable controlling heads from the back of the sheep? If he happens to get one off by itself … does he try to control or just “forget it” and come back toward the others (might give “insight” if he will like to shed)? How much drive/desire he has. When you finish does he keep trying to “go back for more”. How well does he “read” sheep? His thought process. Does he process information and correct himself … or do I need to give a growl to help him “figure it out”. How well does he learn/retain training information. Is he flexible – when I move does he counter – balance or does he eye up one sheep and ignore the others as they move away. If one falls behind … does he try to tuck the one back with the group or flank and take the group back to the one? Or just leave the one behind and work the rest. Does he take correction well or does he get tense, sulk, pout, or “fade out” when ever he is faced with a correction? How much tension does he carry? When/where does he carry it? Can he speed up and slow down when the sheep “call for it” or does he only have one speed no matter what the sheep are doing? How does he respond to sheep breaking or if they stand and face him? At “last but not least” … actually one of THE most important things “in my book” at all times, I’m trying to ascertain his METHOD on sheep. Of course, all the above is in “raw puppy form”. I’m sure a lot of you are saying that’s all very nice but I’m not starting a pup …. BUT I do exactly the same thing with every dog I work. I spend a lot of training time asking questions. So, if you will “ask” these (and other) questions about your dog “each and every time” you go out to work – you will begin to get clues as to what you need to work on. Is he slow on his flanks when he needs to be quick and sharp and that’s why you are missing panels? Does he not put enough pressure on sheep to keep their “thought process” moving forward … if not … maybe that’s why you are running out of time at the pen? Is he eying up as he flanks around … causing a fight or a grip off. Is he stiff on his flanks and not flexible so you never get the sheep penned? Is he flanking too wide/tight causing problems? Is he “drawing” his sheep back on him so much that you are stalling out? If you don’t look and analyze each work session trying to “sort” what he’s doing right from what he’s doing wrong … you can’t correct “the wrong”. The “first step” to correcting a problem is to figure out “why” something is going wrong … then start looking for solutions. IF every time you go out to work you never REALLY observe what the dog is doing that is causing you problems … you’re NOT training you’re just moving sheep around. As one of my students often states “never in my life have I’ve ever worked so hard to be so mediocre” :@). Training working dogs is difficult … no doubt about it. Especially for novices trying to understand dogs, sheep and how they interact. 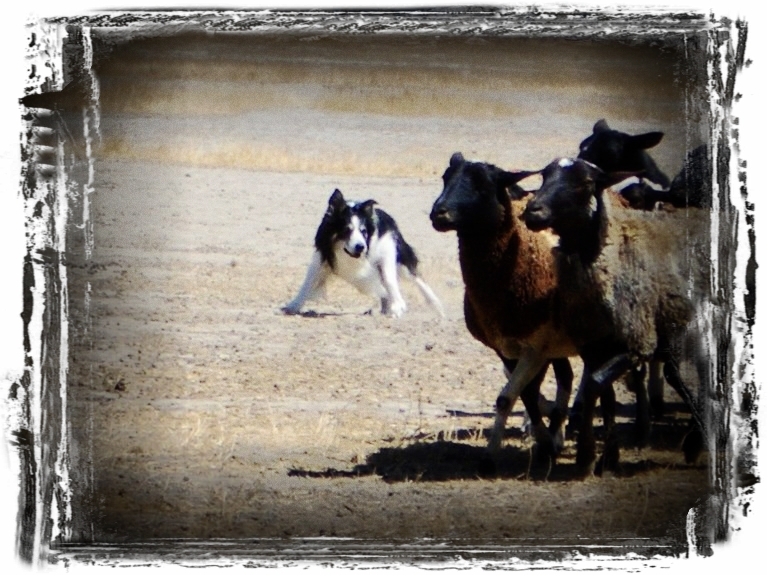 So, what is IT that makes training Border Collies so complex? It’s a combination of different things. The first is that we are not training dogs how to make “just” a physical movement but hopefully allowing them to understand that each of their movements will cause a corresponding movement in the sheep. The second is, “all the while” we communicating “our wants and needs” .. the dog has inborn instincts that are “speaking” to them just as loudly as we are. Then throw in the sheep’s reactions “to all of this” and as they say you better be ready “to step up to the plate”. When you were a child and looked at a book all you saw was squiggles on paper which was impossible to read until you learned each and every letter in the alphabet. Only then those squiggles become letters, words, sentences, paragraphs, and eventually you turned all you learned – into concepts. You can’t get anywhere in your training until you and the dog are ”on the same page” communicating with each other. So, first you have to learn the ABC’s of how to communicate what you need to the dog – while always trying to understand his method of work”. Let’s use the flank is your beginning letter A. Learning how fast, far, tight, etc. 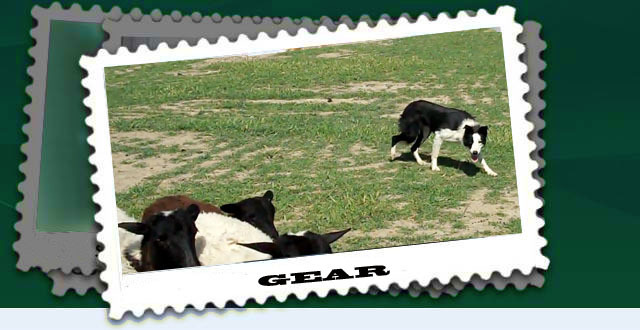 your dog flanks will be a start to grasping your “working alphabet” … if you are saying THERE – to a slow wide flanking dog (while you are watching the sheep not the dog) then he will turn in a totally different spot than a tight fast edgy flanker would. You two need to come to an agreement and get in “sync” to the “timing” of the letter A – before you can make it the first letter of your alphabet. So, spend the time watching your dog, the sheep’s reaction to the dog and try to get your timing perfected so when you tell him something it makes sense to him. If you are working on balance and you are telling him “there” to turn into the sheep and he’s “off balance” … you will erode the “letter” you are trying to build. You will need to reach an understanding” on each letter of the alphabet (and with EACH dog) and apply it to every phase of the work. The same goes for buying a trained dog as to training one. When you first get a trained dog you need to come to an agreement to what ABC means before you can speak the words and then on to a sentences and paragraphs … eventually leading to a book. Again, If you are on “different pages’ in what the basics mean you will never be able to write that novel. Just remember all of this takes time … just as it did to learn the alphabet and to read. So, don’t get discouraged just keep learning those letters and soon you will have enough words to form a sentence, a paragraph and in time “your” book. When things go wrong (as they will) just remember it’s just a chapter not the whole book. He’s progressing well in most areas. He needs work on his hill outwork (hard for this flatlander to find :@) This time of year is the worse time to “trailer out” because of the foxtails … so not sure he’s going to get that until fall. His biggest “flaw” right now is pace. He has a hard time understanding that he CAN work sheep from a distance and pacing himself down. So, that’s the main focus right now. I walk with him for miles and just say “time – time” and he’s fine when I’m walking with him (and putting pressure on to reinforce it). The way I work on pace — I will have around 5 sheep (don’t want too many as it makes him want to flank instead of “line”). I have the sheep on one side of me and the dog on the other … all in a triangle (I’m the point of the triangle). I walk … the sheep walk … and I MAKE him walk. I don’t down him I say time and put pressure on … by taking a step toward him … pointing the crook at him and growl time – if he slows down I release pressure. This allows him to make the same mistake again and get another correction. But it also puts the responsiblity to slow down on HIM. If I just downed him I would be taking that responsibility. I’m trying to keep the distance between me, the sheep and the dog the same the entire time I’m walking with him. If I HAVE to down him … I will but then I “cluck” to him to walk on again. He’s beginning to “get that” but when he takes the sheep and just drives off he will only go so far before he tries to speed up and when reminded to “take time” he “tries” to ignore the command (unless I get loud which is NOT what I want to reinforce … only listen when I yell:@). I try not to work on pace when he’s still fresh and ready to go. I will do a number of outruns to tire him out (if that’s possible :@) before I move on to pace. This allows him to burn some of that youthful steam off before I try to “grind him down”. Sometimes when he does slow down he tends to disengage from the sheep (also not what I want) by stopping and standing instead of slowing down (telling me he really doesn’t fully understand the concept). Occasionally he will turn around and look at me (confusion). When he does that I say nothing … just wait until he looks back at his sheep … then I repeat the command. I could just down him but I always feel that takes the incentive out of them. I would be controlling him instead of teaching him HOW to control himself. That’s NOT to say I never down him – I do. It’s just I’m working on “take – time” (not down … he knows how to down – Well, “most of the time” :@). “All that said” … I would rather have one I’m always trying to slow down that one I have to encourage on. I’m trying to develope an open dog so it’s better to take it slowly making sure I keep the push in him. If the dog has “it” in him … age often cures “too pushy” issues that young dogs have.